If it could be shown that any UFOs were extra-terrestrial in origin, people’s entire belief system would fundamentally change. …and it got me to thinking: what would it take to change my “belief system”? Certainly not UFOs, since I already suspect they’re real. My belief system these days involves submitting to evidence, wherever it leads. Doesn’t it follow, then, that there’s no evidence that could change my belief system? My beliefs, maybe, but not my belief system. Does that mean my belief system is sound, or blind? Do you think that insisting on evidence will avoid life-wasting untruths, or cause me to miss something important? How about you? What could change your beliefs? Your belief system? About a week ago, I had a dream that was unusual because it centered around a philosophical thought: complicated things often have simple explanations. The day after my dream, I thought about the spiral of the chambered nautilus. You may have heard that it follows the pattern of a golden rectangle — said to be the most pleasing rectangle to the human eye. What makes it “golden” is that the sides are in a special proportion: if you remove a square whose side is the short side of the rectangle, then the rectangle that remains will have the same proportions as the original. In this figure, the outer rectangle’s proportions appear again in the pink rectangle, once the blue square is removed. 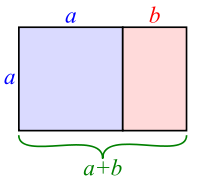 You could repeat the process on the pink rectangle, removing a square whose sides are length b, and leaving a smaller rectangle whose sides are again in the original proportion. Keep doing that, and connect the corners of the squares with a spiral, and you get the so-called golden spiral. Enter the chambered nautilus. Here’s an actual specimen, showing how well its shell really does fit a golden spiral. Now for the point.We see this and it seems miraculous. We jump to a million-horsepower explanation like “There must be an omniscient God who designed it!” However, a much simpler explanation does just as well. 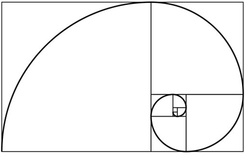 To see it, reverse the process by which we pared the golden rectangle down into smaller and smaller golden rectangles. Instead of paring down, build it up by adding successive squares. At each stage, we have the same overall shape as we did in the previous stage. Likewise for the proportional layout of the inner “chambers” (except now we have one more of them). You can now imagine that if there were a creature who made himself a spiral shell, and whose body maintained the same proportions as it grew, then a golden spiral would be the inevitable result. It seems miraculous, but it’s really simple. I have a feeling that there are simple explanations of many seemingly complex or surprising phenomena, if we’ll just tune ourselves to look for them. August’s 31 Days of Wonder were an experiment to see how I would feel about refocusing this blog (and my life) on the beautiful and true, spending less time railing against the lies that drive me nuts. That’s hard for me because it’s often the willful manipulation of gullible citizenry that gets me riled up enough to spend an hour or two writing a post. However, as far as I know, I have only one life. I want to enjoy it, and being peeved is not as much fun as looking at the Mandelbrot set or marveling at the ribosome. So, for the most part I’m going to hold my tongue. I do plan to write one post about why I left evangelical Christianity, but that will be my last one about religion for a while. As for politics, it will be difficult to rely on others to expose all the lies that will be told between now and election day, but I’m going to try.